The further down the rabbit hole of the breweries in New York you go in the decades around the American Revolution, the further you get from great success. For many of the brewers of the 1700s that we have looked at so far – in the Hudson Valley from Long Island to Albany – brewing led to fame, military honour, riches and political power. The Rutgers and Lispenards became leading citizens to the south while generations of the Gansevoorts held sway to the north. But others weren’t as fortunate to brew for generations or to align themselves with the Revolution’s winning side. Robert Appleby was one of those. It appears. I write that caution as to the victors go the records. “11th mos: 27. Joseph Pritchard was brought into my Room, having been this day tryed at what they call the Supreme Court, for having been employed by the Brittish [sic] when in this City to attend at the Middle ferry on Schuylkill to inspect all persons going in or out of the City & was charged with having since used words greatly derogatory of the present Rulers & being by the Jury, so called, found guilty of Misprision of Treason as they term it, he was sentenced to the forfeiture of half his Lands & Tenements, Goods & Chattles, & imprisonment during the War without Bail or Mainprize . . . Ruined by the order of the court, he was still in jail two years later. A court document from 24 October 1781 states: “The Council taking into consideration the case of the following persons now confined in the gaol of the city and county of Philadelphia, to wit: Joseph Pritchard and John Linley, convicted of misprision of treason…” He was finally pardoned and released. He makes his way to New York where he signs the New York Loyalists’ Memorial, a war-end request for reparations. Like many Loyalists, he is in a slow state of transit before appearing on a 1786-87 petition to be allowed to settle in Lower Canada – or what is now Quebec and Ontario. By 1792, he is settled in Kingston, sat as a member of a jury and, in December 1793, is a tailor suing over money he is owed. He was awarded fifteen pounds. He’s made something of the end of his life. His funeral is held in the main Anglican church in town on 10 August 1802. In the end he attains a level of stability and, in the end, there were records enough to put together a pretty good picture of a pretty loyal Loyalist. He’s a favourite Kingstonian of mine. It didn’t last. Like James Pritchard who is able to live the last decade and a half of his life settled in Kingston, the Robert and Peggy (Margaret) Appleby are thrown into crisis by the Britain’s defeat and their loyalty to the Crown. They had to move on. The records of the New Brunswick Historical Society show he led a company of Loyalist refugees for Port Roseway, Nova Scotia by the ship Williams which sailed from New York on 20 September 1783. His monetary losses are valued at 600 pounds, a sizable sum. He establishes a business in his new country but it fails and, like Pritchard, he finds himself in prison. After petitioning the government – the news of which even makes the New York Morning Post of 24 January 1789 – he is released and returns to some level of status as a member of the vestry in 1788. Again, it doesn’t last. He moves back to the States, to Virginia with his wife. And, like Pritchard, he is recorded as being originally from Philadelphia. That is a long story – actually two long stories – to make a point about records and the fate of two Philadelphia Loyalists. But notice that there is a third character, that spruce beer brewery at Catherine Street, New York, down by the ship yards. Even though I am not able to learn very much about the brewing years of Robert Appleby, we do see him start up in New York in 1779 no doubt escaping the anti-Tory movement in Philadelphia after the British capture and then retreat from the city. Then we see him relocate to a well located sweet water brewery. That brewery stays put. That brewery then starts it’s own life history. Because when the story of people can’t be traced to the level of detail in records you’d like sometimes their works can be. Let’s see who shows up. George Appleby! Who the hell is George Appleby? Ten months after Robert leaves the town someone named George is running a very similar operation out of the Catherine Street brewery. Not his son as he just got married. His cousin? A fluke? Who knows? And he has added a treble spruce beer to his products. What the hell is that? The forerunner to Buckley’s? In 1748, there was a man named George Appleby advertising his blacksmith’s shop teasingly near Rutger’s brewery. He is named in a municipal record the next year. A George Appleby shows up on the provincial militia muster roll for what is now Brooklyn in 1755. He is 28, born in Ireland but listed as a labourer. Same guy? He’d be 21 in 1748. Could be. Only 18,000 people live in NYC in 1760 so maybe. Whoever he/they are someone by that name takes over the Catherine Street brewery in 1784 with the same last name as the former brewer. At maybe the age of 57. And he seems to succeed. If you look at the thumbnail up there to the left, he is brewing pale ale, brown ale and table beer as well as three grades of spruce beer. I never knew the world needed three grades of spruce beer. He is also looking to hire a cooper. And notice that it’s not just George Appleby – it’s “George Appleby & Co.” It’s repeated in the middle ad from 1785. Who are the members of the company? Partnerships are the norm in brewing well into the late 1800s. Is this a real corporation that early into the independence of the USA? Before 1811 you needed a special act of the New York legislature to create an actual corporation. Puffery? Who know? In any event, if you look at the thumbnail to the right you know you can now stop worrying as by May 1788 it’s all over. The Co is no mo. Georgie boy is off with the next truck driving man he can find and takes up with him. And he moves. He and White Matlack are off to nearby Chatham Street to brew their beer there. And they seem to be movers and shakers given they are on the float along with a Lispenard representing all brewers of New York on the occasion of the 1788 constitutional parade in September of that year.They are somebodies – whoever they are. Notice another thing. They advertises in that last ad that that the new brewery is opposite the Tea-Water Pump. I thought Catherine Street had the tea water. Now it doesn’t? A wee secret. After the war, things like infrastructure break down and people flood the city. The water gets a bit crap. And much of it was brackish and disagreeable to begin with. In the mid-1780s they are already looking for good water. Remember that. On we move. Time marches on. Keeping up? Keep up. George Appleby may be gone but the Catherine Street brewery is alive and kickin’. In the ad above to the upper left, right under the one for Appleby and Watson’s place in the New York Daily Advertiser of 10 March 1790 there is one for the new operators, Watson, Willett and Co. Their technological advance is they are brewing with real spruce essence, not off the bough. Plus table and ship beer on draught or in the bottle. Ale is gone. The two breweries seem to have a hate on for each other as they have run these ads up against each other for months. But then that doesn’t last as by five weeks later, as we see in the upper right ad, Watson and Willett and Co. gives Watson the boot after a fire with the result that the Catherine Street brewery become run by the partnership of Willett and Murray. The survivors struggle on with part of the hops and barley saved. They keep on keeping on. They seem to be in charge of the place still in 1794. As, it turns out, does George Appleby. He gave notice in the New York Daily Gazette of 21 June 1791 that he was operating out of the Golden Hill brewery of our old pal, Medcef Eden according to the lower left ad. He’d be 64 now, if he is him. The lower right ad tells the tale of how his former partner White Matlack kept the Chatham Street place by the Tea Water Pump and carried on, brewing all alone. Have you got that straight? I need an interactive map and Gantt chart app for my mobile to keep it all straight. We will leave it there in the early 1790s for now. We’ll be picking it up. There’s a fair bit of foreshadowing in all that. A sort of an era is sort of at an end. The era of easy water? The era of the great ale brewing families? Could be. We will have to see. => There was a trade in importing beer into New York at least as early as the 1750s that developed into fairly elaborate retailing later in the century. => There was a trade in exporting beer out of New York at least as early as the 1790s. => In partial response to raids from New France down the Lake Champlain corridor and events like the Schenectady massacre of 1690, established brewing, two established brewing families – the Albany Dutch Rutgers and the New Paltz Huguenots Lispenards – migrated to the south, set up brewing operations along the natural water sources and particularly their own drainage works in lower Manhattan, intermarried and became fantastically wealthy and powerful. => They were not alone. Around the corner from the Rutger’s brewery on Maiden Lane – named for the former creek where Dutch maidens washed the laundry in the early 1600s – Medcef Eden of Golden Hill set up his brewery in the 1770s in a former meadow along a branch of the watershed flowing down a few hundred yard to the south to meet up with “Maagde Paatje, a footpath used by lovers along a rippling brook”. => William D. Faulkner appears in Brooklyn in the years before the start of the Revolution in 1775 and establishes his brewery further north on Manhattan before ending up in Albany. His reverse route compared to the Rutgers and Lispenards was due to the fall of New France and the securing of the northern route. => And the man who was born into this world as rich boy George Harison but died as George Harrison builds a brewery at scale on the west side in the 1760s by a wharf – and it never quite seems to do as well as it should have. Israel Horsfield, Senior, left three sons, Israel, Junior, Thomas, and William… In 1764, his brother Thomas formed a’ partnership with James Leadbetter, when they advertised for Barley and Oak-bark. The next year, they have for sale at their brewer}-, English Ale, Table, and Ship Beer ; but soon after they dissolved, wheu Thomas, again had “Excellent Ship and Table “Beer, from the Long Island Brewery” which was kept at the store of his brother, William, opposite to Lot & Son’s, in the City of New York; and, in 1778, Captain Thomas Horsfield had about three thousand weight of excellent fresh ship bread, for sale at Brooklyne ferry. The present Middagh-street was, at an early period, known as Horsfield-street. The article conveys some sense of the family having both a certain level of established wealth in the 1760s and 1770s as well as an unsettled aspect. In 1769, Israel, Junior tries to sell the property which consisted of a house and lot of ground, a slaughter house and barn. Two years later land is for sale again as five lots at Brooklyn ferry, adjoining the house of Israel Horsfield, Junior, situated on a rising ground “which commands a prospect of the City of “New York, and very commodious for gentlemen to build small seats on, or for gardeners or butchers. 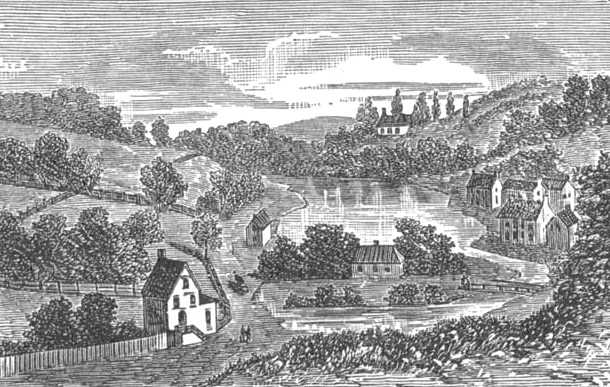 And again in 1772: “to let, “The large, new brick house, in which Israel Horsfield, Junior, now lives, at the ferry; is “very convenient for a butcher.” Soon after that, Israel, Junior, engaged in brewing with Thomas about eight years after Leadbetter moved on to the Harrison brewery on Manhattan’s west side. Middagh Street is still there in Brooklyn, the west end of which faces southern Manhattan. Click on the thumbnail to the right. That’s John Hinton’s map “A plan of the city and environs of New York in North America” from 1776. It shows what is almost certainly Middagh Street, then Horsfield Street, as a country lane to the south of the very small community of Brookland Ferry proper. This detail from the 1770 Ratzer map’s panorama view gives a sense of how small it was. See also this blurry detail from Ratzer’s later 1776 map. [I am now telling myself that paying attention to keeping the three maps distinct is important.] Notice from the notice up there from October 1764 that the brewery is both “opposite the Ferry” and facing their wharf. Is the Horsfield butchery and brewing complex on the shoreline at the end of Middagh Street or closer in to the main community? Middagh is currently over 300 metres from the suspiciously named Water Street in Brooklyn which I expect was near the actual original shoreline. Although Water Street is between the shore and the even more suspiciously names Front Street. Look at this comparison of the 1776 Hinton and today’s Google maps image. Middagh now appears to be a boundary line between fields back then. Land moves over time. Or at least shorelines do. Maybe the family owned multiple parcels. You can read about more of the later history of the area at the ever excellent Forgotten New York. To the left you see something of the motherlode. The golden moment you dream of finding. It is the notice of the apparently unsuccessful sale of the brewery placed in the New York Mercury of 2 November 1767. It contains an incredible… or perhaps an extremely credible volume of detail about the brewery. First, notice that the ad is placed by Israel Horsfield, Senior. The old man is still around and in charge of the assets even though it was son Thomas who was operating the business with Leadbetter. Wow. Later: OK, 11:20 am. What do we see in the notice of 2 November 1767. The lot is 112 fronting the river and it has its own dock with a certain depth – “a ten or twenty cord boats could discharge along side. The maps by Bernard Ratzer are largely formed from surveys taken in the same year. As an official British government document, locations of wharves and docks would be an important bit of data. But there is other information in the notice, too. There was 46 barrel capacity in two kettles. There seems to be five structures, four in brick. It has drains. A significant investment. They can steep 140 bushels of malt at a time. The 3:1 ratio of malting a bushel to brewing a barrel looks right. Why was it for sale? Well, it appears that after Leadbetter left in 1765 for the greener pastures of the boy millionaire George Har(r)ison and his plaything of a brewery, the Horsfields were left without quite the same business position they might have imagined for themselves. In June of 1765, the dissolution of the partnership is announced and, ominously, 300 bushels of malt is offered for sale. The next month, they are offering to sell hundreds of pounds of hops. And in September 1765, even though they are offering beer for sale at the brewery as well as, interestingly, their cellars in the city itself, they are also looking for an investor to buy a 50% stake in the brewery. It appears not to have worked out in 1766 for them at all. By the end of the year, there is a writ of execution being exercised against Thomas Horsfield. Daddyman Israel Sr. must have stepped in at that point given, as we see above, the brewery is up for sale under his name. The Horsfield family’s prospects keeps waffling as brother William with the store in the city goes under but by the middle of 1768, Thomas is sufficiently secure to be the co-receiver of his sibling’s debts and in 1769 get the insolvency discharged. In 1770 the brewery is still in the hands of the father. He had had brewing tenants earlier but in January one is Garret Rapelje is selling off all the beer and other stock – but not the equipment – while in April of the same year William D. Faulkner takes the same route as Leadbetter did five years before and shifts his operation to Rutgers old brewery on Maiden Lane in the city where another twenty years of success await. By June 1771, the Brookland Ferry brewery is again up for sale. A notice for its sale from February 1772 helpfully adds the dimensions of the buildings. It is still for sale in May 1772 with two interesting addition to the notice. It’s more clearly stated that it is Israel, Sr involved and he brags up the kettle capacity a bit. Maybe it’s just me and tell me after 244 years if it is still too soon – but do you think one issue might be the Horsfields might not be exactly the people you want to do business with? While this goes on and on, something I appreciate being on the typing end of it all, notice one thing. Or rather one person. In at least the outset of 1770, Garret Rapelje is running the brewery. In one of the Razter maps of New York, there is a reference to the property of one “Mr. Rapailie” right next to one of the two wharves at Brookland Ferry. If the name is Dutch, “Rap-el-yee” would be the pronunciation. Which probably tells us that this doomed brewery was located on the north and east side of the road. Israel Sr dies soon thereafter and in December 1772 his house and the brewery are all up on for sale at an estate auction. I was thinking that was it. That the operation died with the old man. But eighteen years later, one more notice was posted in the newspapers of the time which adds one more fact. In the New York Daily Advertiser for 6 August 1790, the property is up for sale or lease offered by the owner Cary Ludlow. He doesn’t seem to get rid of it until 1795 when it appears to be in the hands of a Mr. Sing. Good luck to you, pal. In addition to the name of the owner, the address is given in Ludlow’s notice. And 184 Water Street still exists. It looks like this – like something out of a police drama, one end of the Brooklyn Bridge rising in the background. What Has The Last 35 Years Been About Anyway? In 2006, as I started this blog, craft brewing was just a sleepy little current in the overall beer market–still a “boutique” segment. In the next decade, growth has been so strong that it is now a given that it’s the future of beer. Imagine what the next decade will hold. Why do I disagree? Because I think craft beer might well be dying if it is not already dead. What do I mean by this? Well, we are in the middle of a very rapidly developing transition in which many of the folk who began macros are clocking out. Not as immediately as 1970s rock stars but they are handing in their badges and finding something else to do. Papazian has packed it in. Many breweries have broken their world and cashed in or cashed out. Koch spent 2015 adrift on a yogurty sea as the suits moved in. Sales of big craft are down and we are all awaiting the news of how the BA is going to manufacture an increase in craft beer sales while many of its membership abandons the definition for sunnier days. Cider is suddenly not the future. What is? Who cares? None of that matters. Because I think the future is upon us now. What people do not seem to appreciate is that beer is easy and cheap to make and the 12,000 brewery universe – or at least western world – is largely populated by little, nimble and local brewers. The millionaire toyboys behind BrewDog have nothing really to do with punk. But the little garage breweries do. Look at this. If you ignore the obviously problematic infatuation with the thesaurus, you see a story of nothing to something over a little more than a year. It’s happening in so many local markets that it’s common. It’s happened in my own town. The story is now too complex to be told. We have a natural inclination to hang on to the things we are familiar with. The people we looked up to. Their ways of doing things. But over the last year the leaders of big craft movement lost the bench. Yet seeing as they only arose under a decade ago – 25 years into the movement – that is fine. A blip. Craft as they describe it might well be over. It’s certainly not rising. The small and confident are. The macro industrial buyers of big craft are. The middle grounds is being abandoned. Soon the pink line will cross the red one. Excellent thing, too. Over the last 35 years, change has been constant. This point is time is not special. It’s just another point of reflection that will be forgotten soon as the next thing comes along. Looking forward to it. Author AlanPosted on January 21, 2016 January 22, 2017 Categories Commentary, Craft Schismists, USALeave a comment on What Has The Last 35 Years Been About Anyway? Remember last July when I explained how I actually tasted beer? This is another one of those posts. Not looking to convince you of anything but just to set out what I actually do. First, let me get this out of the way. One of the oddest things about beer is how it triggers a particular sort of outrage. We see it often in relation to the libertarian response to public safety advocates lobbying for lowering the levels of acceptable blood alcohol for drivers. My rights! The stats are wrong! The lawyers are lining their pockets! We see the same sort of thing when public health officers bring out advice about lowering your alcohol intake. My rights! The stats are wrong! The doctors are lining their pockets! I find these complaints boring and odd. Amateur LLBs meeting amateur MDs. They come across a bit addled or at least conflicted in ways that I don’t get. And a bit like a 1950’s TV ad for smoking. Certainly, killing yourself off early is preferable to killing off others but still… who really is driven to strongly react to folk seeing to reduce, you know, death. I bet these days even aging 1970s rock stars might be more inclined to wonder what a few fewer trips to the cookie jar might have meant to one’s latter years. If booze means that much to you, find something else to care about. Get a hobby. Or a fish. Find happiness in a snowflake FFS. But… I am not here to point fingers and certainly not name names. Folk live their own lives and can react to these things as they see fit as long as they don’t harm others. Yet there is one thing I think would help immensely with the dialogue generally. Get rid of the idea of the “unit” that the public health advocacy is based upon. It just fogs up the whole discussion. You see it in Canada. You see it in the UK. Here, we still live in the 15 drink universe. In the UK, the outrage is the announcement of the 14 unit week. Yet what is a unit to you? Nothing. You require an online calculator to understand the implications. And no one is looking at one of those mid-session. By creating an arbitrary standard, you do not describe the experience as the people you are advocating to experience it. It muddles and befuddles. There is a better way. Milliliters of pure alcohol. Let’s stick with Canada as I never could figure out the UK model. * There are 17.05 ml of pure alcohol in a standard 12 ounce standard 5% bottle of Canadian beer. We like standards. Canadians are obsessed with 5% beer. If a beer has only 4.8%, it’s is dishwater. Another at 5.2% is Satan’s route to your soul. We are very regular in these matters. So the prime unit is really 17 milliliters. Which means 15 of them for a Canadian man in a week is 255 ml. A 750 ml bottle of what most call hard liquor (aka spirits) also comes in as another Canadian standard: 40% alcohol. Which means a bottle of hard liquor has 300 ml of pure alcohol. Are you with me? Good. Wine is trickier as wine has a range of strengths. Light whites can be 9% or under while reds commonly top 14%. But they come in 750 ml bottles. So the quick mental calculation is based around three-quarters. Meaning a 750 ml bottle of mid-weight 12% wine has 90 ml of pure alcohol. 17 goes into 90 around five times. Five servings in a bottle of wine. Simple. You see where I am going? Which means the average standard week recommended drinking per adult is a bit less than a 750 ml bottles of hard liquor or three bottles of wine or 15 bottles of beer. I don’t know about you but not only does that not seem like a small amount – it also does not seem to be equal. I would likely think myself a bit of a loser if I gunned a large bottle of, say, Gordons or Dewars a week. Three bottles of wine each seems a bit much, too, especially as I would be sharing that over the dinner table with another but I suppose I would feel a bit better about splitting a bottle of wine a night than I would being that gin bomber draining alky even if it might cost me twice as much. And, you know, the beer doesn’t seem like all that little at all. I wouldn’t want to have two or three beers a day most days of the week – but, again, I also would not feel like a gin dipso if I had fifteen in a seven day span. I certainly would not be sitting down to go on about the nanny state… in public… on the internet. If the numbers were put in those simpler terms, stated as normal purchasing sizes over a week it seems to be folk would more easily get the message – pace yourself over time and keep it sensible. Yes, there is the jerk who drains the Gordon’s quart in one sitting as part of his healthy lifestyle but that person is, in fact, the jerk. These guidelines – all guidelines – should in fact come with a jerk disclaimer: “Warning: you are a jerk, you will not do this anyway so don’t bother complaining on your blog about it.” For most other sensible people it might get the point across better. Works for me. Which is all I was wanting to mention. *Which, yes, I do see that the “unit” in the UK is only 10 ml and you now only should have 14 of them which is quite funny as it means the recommended amount is 140 ml a week as opposed to 255 ml here in Canada or 55% of the Canadian levels. Is that right? I’d be outraged! Unless… well, I bet Stonch is about 55% of one of me. He’s only wee. Maybe that’s it. What The Heck Was Going On in 1680s Staffordshire? Secondary sources. They always let you down. Throughout the early years of the 18th century parishes were complaining that the upkeep of the roads through them was impossible due to the increased traffic. This is especially true of Staffordshire: so many through routes were being used, the travellers along them having no business with the parishes concerned. Steps were taken to remedy the situation with the increasing turnpiking of major routes, effectively privatising the main roads. Turnpike Trustees were appointed to oversee the collection of tolls, which they used in order to maintain the highways, any theoretical profit returning to the trustees. Being on the cusp of greatness does not make one great. Safe commercial connections for moving beer in the medium future does not make it safe in the present. So, it may well be those sitting around the bar at the Brimstone Alehouse in 1686 lived long enough to see the ales of Burton on Trent be recognized for being something bigger than a balm for the scab and itch. But in that year they may have been among the few enjoying the particular delights of the region’s sulfurous brew. Does The Natural History of Staffordshire written at the time help with the question? To be fair or even just honest, Plot’s book is a survey of the natural and economic characteristics of the county, a scientific study based largely on the four humours. It’s not a gazetteer of commerce like you might find in the 1800s. Trades are referenced in connection to the considerations of the air, water and soils. Burton itself gets passing mention and mainly what is mentioned is the bridge. Brewing is not a focus. The word “malt” only shows up once. Yet beer and ale are mentioned. We are told that they have an Art in the county of making good ale. * Folk are described as paying respect to certain wells on the saint’s days “whose name the well bore, diverting themselves with cakes and ale, and a little music and dancing.” One noted human oddity of the county, however, was a person who “drinks neither wine, ale or beer.” Another, a baby who lived only three days even though it “took milk and beer freely enough.” And, perhaps crucially, the setting up of a cheese factory by Londoners is described in some detail as is another group making salt by evaporation – including using in one process “the strongest and stalest ale they can get” to make the crystals set as desired. Robert Plot describes the Staffordshire he visited in pastoral tones. If there was a trade to London in beer like there was in cheese he might be expected to have mentioned it. But he didn’t. Coming 26 years before the navigation improvements made to the river Trent and many more before the improvement of the roads it’s most likely that the markets did not yet exist for brewing at scale for export beyond the local market. It didn’t not yet sit even in the shadow of other noted brewing centres like Hull and Margate. One record I do not have and which may not exist would be helpful. The excise duties on beer and ale introduced in the 1660s, which came into being with the Restoration of Charles II to his thrown might be quite helpful if they drilled down into county by county assessment, town by town. It would help sort out where the brewing was going on by providing a contemporary primary record. For now, a book like Plot’s is the best we have. Certainly, it seems, better than Peter Mathias’s… at least on this point. We only know what the records tell us so far. Author AlanPosted on January 4, 2016 October 24, 2017 Categories 1600s, 1700s, England, HistoryLeave a comment on What The Heck Was Going On in 1680s Staffordshire? Does Canal Based Burton Ale Defeat Coastal Ales? Wenceslaus Hollar. “K” to lower left is Brewer Street. Full map here. Dependencies. Things change in large part because other things have changed first. In the mid-1980s, change happens to beer because other things have changed that lay the groundwork first. Cable TV has brought Julia Child, The Galloping Gourmet, Jacques Pepin and then the Frugal Gourmet into the home. People drinking wine on TV in the middle of the afternoon. Imported beer brought different branding and tastes into the home which in turn lead to home brewing which is also dependent on 1970s home gardening and your mother baking bread. These changes are as important to the triggering of the start of micro brewing as social media was to the last ten years of craft. When I was researching and writing the period 1900-1984 for Ontario Beer I realized there was a fabulous marker right at the end of that span that helps understand where we were just before micro takes off. There was one last display of pride in Canada’s industrial beer. For a few years Bob and Doug McKenzie were among the most well-known comedy duos in North America. As a regular feature of legendary sketch comedy programme SCTV, the McKenzie Brothers appeared on the CBC in Canada and then late Friday night on NBC across the United States. In each short episode, the brothers from a suburb near Toronto gave their drunken thoughts on a topic in the news while smoking, drinking and grilling back bacon for sandwiches. On the set, cases of stubbies from both Molson and Labatt were featured prominently next to an outsize map of the country. Played by Rick Moranis and Dave Thomas, the skits spun out a top selling comedy album, a hit single featuring Geddy Lee from Rush, and a feature movie all largely centered on their love for and dependency on Canadian beer. SCTV was big. It wins the 1982 Emmy for variety TV writing after gaining most of the nominations. The McKenzie Brothers skit was big – two knuckleheads and their love of macro. The movie, Strange Brew, comes out in 1983 to mixed review and the moment passes. No mention is made of microbrew despite the entire film and the entire schtick of the skit being about beer. Because it has not been caused yet even if the context has been prepared. We must obey chronology. => Records exist of brewing at Hull before the 1600s with plenty of activity from the 1630s to the 1690s. =>The first consignment of Hull ale is sold in London at the Peacock, Grey’s Inn Lane in 1623 according to Mathias at page 150 with a specific footnote. => In the mid-1640s, Members of Parliament including the Speaker of the Commons are noted as being sent Hull ale by the municipal corporation as a bit of a thank you and a bit of a home town PR boost. => Pepys drank Hull ale in 1660. He also drank Northdown ale in the same year. And Margate ale. All strong coastal ales. => Around the 1660s, the scientist Robert Boyle is studying freezing and uses Hull ale in an experiment. => In 1681, the grumpy guy makes his complaint about overpriced over strong Hull ale and does not list Burton among the fellow accused. => In 1708, Benjamin Printon became Burton’s first common brewer. => In 1711, George Hayne obtained the lease of rights to undertake the work of making the Trent river navigable between Burton and Wilden Ferry, to the southwest of Nottingham. => In issue 383 of The Spectator from 20 May 1712, Addison notes going out for the day in London with his pal Sir Roger. A couple of high society lads, they have a glass of Burton ale at an outdoor pleasure grounds, the Spring Garden at “Fox-Hall” or Vauxhall. => In Poor Robin’s Almanac of 1759, Hull ale is still included in a list of great British beers being compared to Canary wine. Burton is not. => Hull remains a significant and growing brewing center in the 1800s. See, that quip about “the humour of the people altering to the liking the pale north-country ale better”? That is Burton. In 1723, the Rev. Lewis linked the death of Northdown / Margate ale, the darling of 1600s Restoration London to the rise of Burton. In that time – that year of 1712 – did Burton have some sort of advantage over dominant the coastal Northdown / Margate ale and likely Hull ale to a lesser degree? €Price? Clarity? Rarity? I don’t know even if plenty has been written on its properties. But something caused change, that is for sure. There was change and the change was caused by making the Trent navigable to Burton in 1711-1712. Without that, there is no means for Burton to become so popular outside its local market. As cable TV cooking shows were to microbrewing, that canal work provided Burton its opportunity. Author AlanPosted on January 3, 2016 January 22, 2017 Categories 1600s, 1700s, England, History1 Comment on Does Canal Based Burton Ale Defeat Coastal Ales? So What Was Northdown Ale In The Later 1600s? A bit over two years ago, I stopped writing this blog. It wasn’t because blogs are dead — I refuse to believe that — and it wasn’t because I got bored, and it certainly wasn’t because I was running out of things to say. Blogs, good blogs, relevant blogs still are vital, and they don’t have to be on Tumblr, or run through a microplane grater and splattered onto Twitter, or covered in kitties and posted on Facebook. Blogs are the place to do long-form writing, and I like to think I was able to balance somewhere between a tweet and tl;dr. Even though I shared in the publication of two histories the year before, 2015 was the year I think I took my interest in brewing history most seriously. That few care about the state of brewing and porter selling in New York City in the decades around the Revolution is no concern of mine. It’s important just to write about it. Same with the centuries of brewing on Golden Lane and life in London, England’s district St. Giles’s Cripplegate. These things are interesting because they are true. Went to Margate; and, the following day. was carried to see a gallant widow, brought up a farmeress, and I think of gigantic race, rich, comely, and exceedingly industrious. She put me in mind of Deborah and Abigail, her house was so plentifully stored with all manner of country provisions, all of her own growth, and all her conveniences so substantial, neat, and well understood; she herself so jolly and hospitable; and her land so trim and rarely husbanded, that it struck me with admiration at her economy. This town much consists of brewers of a certain heady ale, and they deal much in malt, etc. For the rest, it is raggedly built, and has an ill haven, with a small fort of little concernment, nor is the island well disciplined ; but as to the husbandry and rural part, far exceeding any part of England for the accurate culture of their ground, in which they exceed, even to curiosity and emulation. Which tells us there were many brewers and much malting in a rich farming district. And notice another thing from the quoted text further up. Thanet. Which reminds us to ask the particular question – where exactly is Northdown? 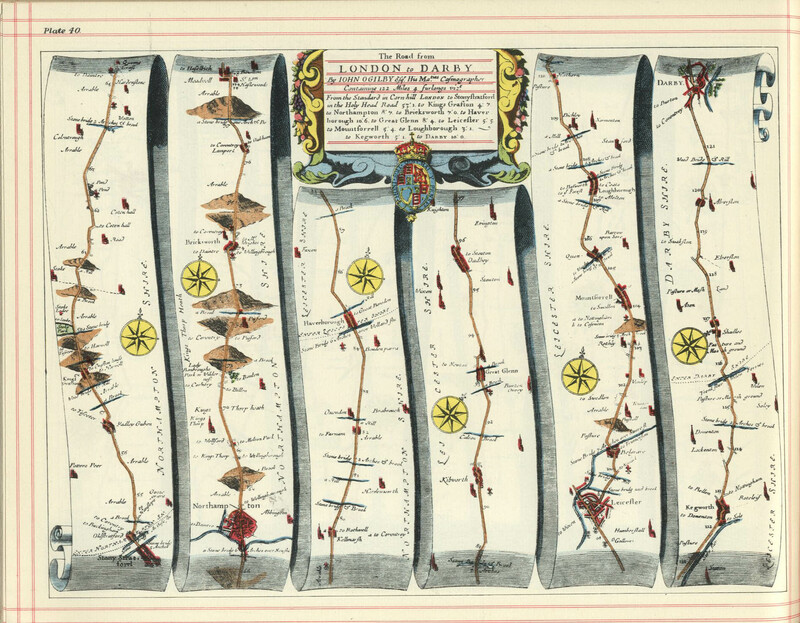 That image above is from this map from 1711. If you click here you will see a supremely confusing cross-referencing of the 1711 map with a 1623 image on Jeffery’s post. See, before branding, newspapers and scientific brewing you needed to know where a beer or ale was from to figure out what to expect. Northdown is located in southeast England in the county of Kent – as in land of the noted hops. But the land of hops most noted about 200 years after Herrick wrote his lines. It was, also, the site of the October 2015 drinking session of the year as recorded by Team Stonch. So in the 1600s, the 1800s and the twenty-first century, a place of good beer but in each era quite distinct good beers. Click on that image to the right. It’s a paragraph from a 1681 treatise entitled Ursa major & minor: or, A sober and impartial enquiry into those pretended fears and jealousies of popery and arbitrary power, in a letter. Clearly an unhappy guy. But what he’s unhappy about is how, in tough economic times, brewers are making undue profits by not only jacking up prices but doing so by having “devised several name” for drinks including China ale, Hull ale – and Northdown ale. Sound familiar? Double the price for poorer beer? And you thought craft beer invented that trick. It appears to have been quite popular with the well placed in addition to the poets. John Donne – the Younger³ – recounts being sent a poem along with “a dosen bottles of Northdown ale and sack” which means it was good enough to bottle and, seeing as it was sent by Lord Lumley, good enough for the Peerage. Which might explain the jacked up price. A premium ale for those that can afford it. Notice one more thing. Sally Jeffery suggests there was indication that the ale was dark but also sees that “[t]he wheat stubble that is left is either mown for the use of the Malt-men to dry their Malt…” which, as we know, would make the sweetest, palest malt during that era. Enough to confirm anything? Nope. All we see from this set of records is clearly (i) a premium product, (ii) defined quite clearly to a time and place which was (iii) notably strong and (iv) bottled. The best ale during the Restoration? Maybe. *Likely this John Phillips, royalist lad and nephew of Milton. With crowns of greenest parsley. I’le eat and drink up all here. Author AlanPosted on January 2, 2016 December 27, 2017 Categories 1600s, 1700s, England, History4 Comments on So What Was Northdown Ale In The Later 1600s?